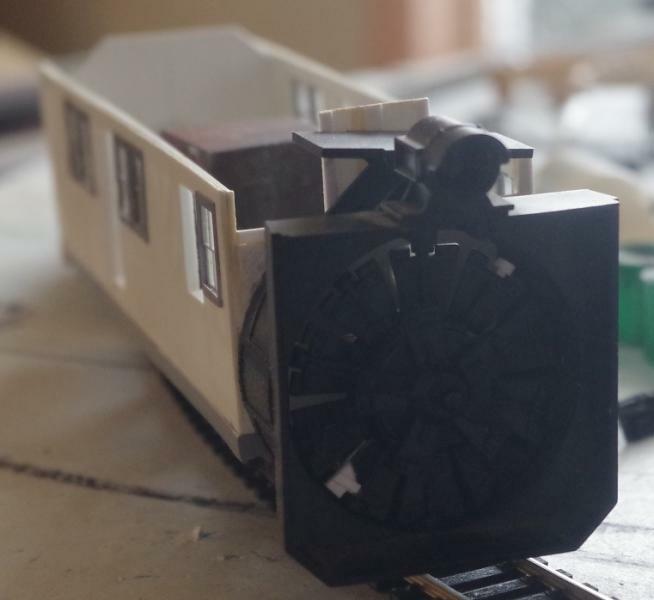 Rotary Snow Plow for my 2 & 1/2 line. Based on X RGS #1, then GNRly, Then K&S (3Ft), then CPRly, finally the KVRly. looking goodare you building from some drawings? I was VERY BAD a couple of weeks back ! 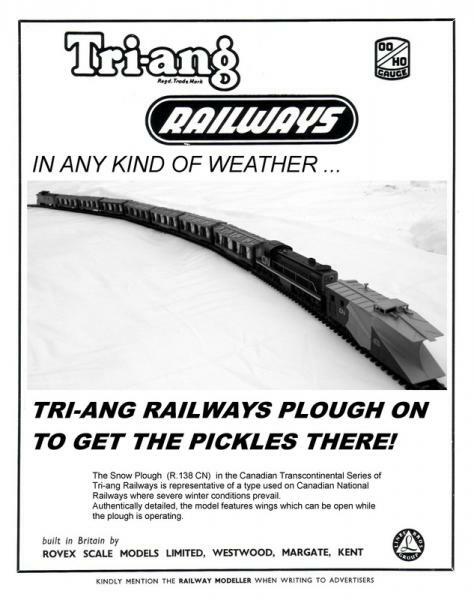 Scoring one of the nice ol' Tri-ang HO snow ploughs, for that 'rubbergauging' I'm supposed NOT to be doing any more ! Found quite a funny Canadian themed ad. for it, from back in the day as well. I do like a good snow plough in any case. Now, what's going on with all those R127s ? Wondered why the price on eBay has ROCKETED recently. Someones been HOARDING THEM !! ...ploughs, cranes, tanks, EVERYTHING ! Last edited on Sun Mar 18th, 2018 04:22 pm by Si. A front end photo of the plow. Used various set's of plans of Snow Plows to build from, also a BLW Sn3 model of RGS #2. Had to reduce plans, to fit the plow front from Mikes Trains. Forgot the R127s were in the back ground, only have 3 of them, picked up over the years from my LHS. Not me buying them off E Bay. Great job, and I like your mention back a few posts of 2 1/2 instead of 30! 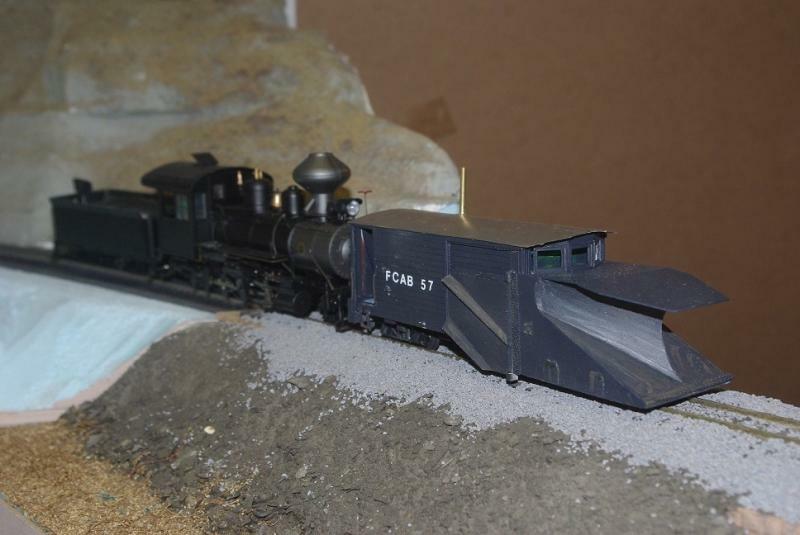 The plow has a width of 9 ft , typical rolling stock for the FCA(C)&B was based on 1 meter gauge. Freight cars were 8Ft 6In by 33 Ft 6In. Passenger cars were 9 Ft in width by 49Ft 8In in length. but plans were in place from about 1913, hence the standardization of 1 Meter gauge rolling stock. Great lookin' wedge plow you made Ken !
" THE PICKLES MUST GET THROUGH !! " Last edited on Sun Mar 18th, 2018 04:27 pm by Si.